A way organizations deal with the progression towards a more connected and API driven world, is by implementing a lightweight SOA/REST API architecture for application services to simplify the delivery of modern apps and services. In the following blog series, we're going to show how solutions based on 3scale and Red Hat JBoss Fuse enable organizations to create right interfaces to their internal systems thus enabling them to thrive in the networked, integrated economy. 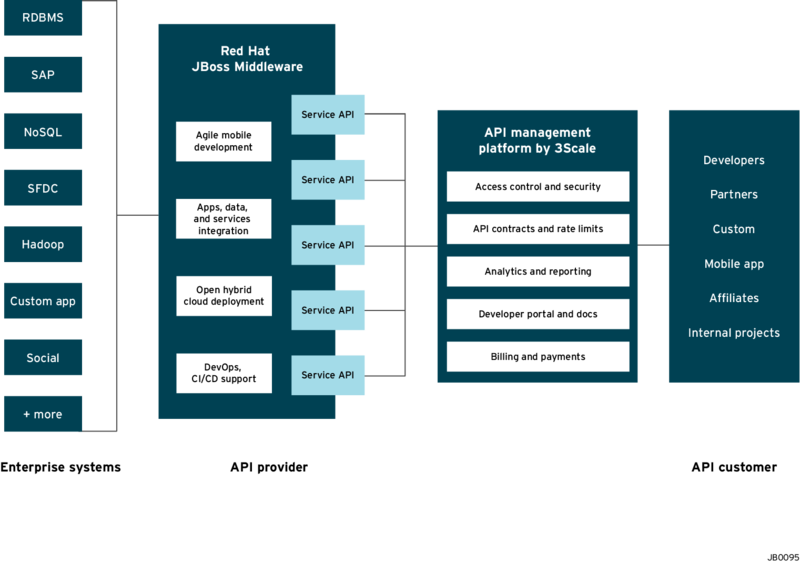 The illustration below depicts an overview of the 3scale API Management solution integrated with JBoss. Conceptually the API Management sits in between the API backend that provides the data, service or functionality and the API Consumers (developers) on the other side. The 3scale API Management solution subsumes: specification of access control rules and usage policies (such as rate limits), API Analytics and reporting, documentation of the API on developer portals (including interactive documentation), and monetization including end-to-end billing. Part 3: Testing the API and API ManagementThe diagram below shows what role the various parts play in our configuration. We will create a Fuse Application that contains the API to be managed. We will use the REST Quickstart that is included with Fuse 6.1. This requires a Medium or Large gear to be used as using the small gear will result in out of memory errors and/or horrible performance. Step 1: Sign onto your Openshift Online Account. You can sign up for a Openshift Online account if you don’t have one. Step 2: Click the Add Application button after singing on. Step 4: Now we will configure the application. Enter a Public URL, such as restapitest which gives the full url as appname-domain.rhcloud.com. As in the example below restapitest-ossmentor.rhcloud.com. Change the gear size to medium or large which is required for the Fuse cartridge. Now click on Create Application. Step 7: After signing on click on the Runtime tab and the container. We will add the REST API example. Step 9: Scroll down to examples/quickstarts and click the rest checkbox then add. The REST profile should show on the container associated profile page. Step 10: Click on the Runtime/APIs tab to verify the REST API profile. Step 11: Verify the REST API is working. Browse to customer 123 which will return the ID and name in XML format. Once we have our API set up on Openshift we can start setting it up on APIcast on 3scale to provide the management layer for access control and usage monitoring. Step 1: Log in to your 3scale account. You can sign up for a 3scale account for free at www.3scale.net if you don’t already have one. When you log in to your account for the first time you will see a to-do list to guide you through setting up your API with 3scale. Step 2: If you click on the first item in the list “Add your API endpoint and hit save & test” you’ll be taken directly to the 3scale Integration page where you can enter the public url for your Fuse Application on Openshift that you have just created, e.g restapitest-ossmentor.rhcloud.com and click on “Update & test.” This will test your set up against the 3scale sandbox proxy. The sandbox proxy allows you to test your 3scale set up before deploying your proxy configuration to AWS. Step 3: The next step is to set up the API methods that you want to monitor and rate limit. You will do this by creating Application Plans that define which methods are available for each type of user and any usage limits you want to enforce for those users. You can get there from the left hand menu by clicking Application Plans. Step 4: Once you have all of the methods that you want to monitor and control set up under the application plan, you will need to map these to actual http methods on endpoints of your API. We do this by going back to the Integration page and expanding the “Mapping Rules” section. And creating proxy rules for each of the methods we created under the Application Plan. The deployment will take a few minutes but once it is fully deployed the Fuse application will be accessed through the APIcast gateway (the Public Base URL) hosted on apicast.io, to provide full access control and usage monitoring of your API. If you now log back in to your 3scale account and go to Monitoring > Usage you can see the various hits of the API endpoints represented as graphs. For more details about the specific API Management features and their benefits, please refer to the 3scale product description. For more details about the specific Red Hat JBoss Fuse Product features and their benefits, please refer to the Fuse Product description. For more details about running Red Hat JBoss Fuse on OpenShift, please refer to the xPaaS with Fuse on Openshift description.